Chelsea boss Maurizio Sarri said Eden Hazard may be the best player in Europe, after the Belgian scored a hat-trick as the Blues went top of the Premier League with victory over Cardiff. Hazard scored twice in seven minutes before half-time, after Sol Bamba volleyed home for the visitors, to help Chelsea make it five wins from five so far this season. He scored his third with a late penalty after Bamba brought down Willian, who added the Blues' fourth from long range. 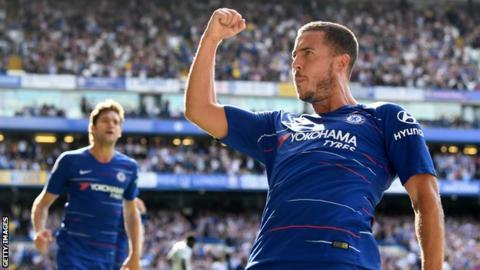 Speaking to the BBC's Match of the Day, Sarri said: "Eden Hazard is unique. "I thought he was one of the best in Europe. But now I am changing my mind as maybe now he is the best in Europe." Saturday's victory means Chelsea have started a Premier League season with five successive wins for the fourth time, and first since 2010. Defeat for Cardiff extends their winless run to six games, their worst spell since Neil Warnock was appointed manager in October 2016. They started well at Stamford Bridge, and deserved the lead given to them by Bamba, but Chelsea's quality ultimately shone through. The Blues have five points more than at this stage last season, but Sarri still wants his side to improve as they prepare for a busy two weeks during which they face second-placed Liverpool twice - in the league and EFL Cup. He said: "I am very happy with my players. But I always think we can do better. We are very dangerous in the offensive phase but we aren't as solid defensively as I want. I think we can improve quickly, though. "I think at the moment Liverpool and Manchester City are another step up, so we have to improve, and I hope next season we can be on the same level." Chelsea came into the game in much the better form, but it was Cardiff who dominated the early stages - much to the hosts' frustration. But, after Bamba's opener, Hazard changed the game with a low 37th-minute strike and doubled his tally with a heavily deflected shot after Olivier Giroud did well to lay the ball to his team-mate. The Belgian wrapped up his hat-trick late on to seal victory for a Chelsea side who rarely looked in danger of conceding in the second half. After goals against Newcastle and Bournemouth, as well as against Scotland during the international break, Hazard has scored six goals in his past four games. He had appeared to be on the verge of leaving Chelsea in the summer after six years with the club, but new boss Maurizio Sarri is getting the best out of him. And his performance meant Chelsea did not need to rely on a late goal - as they had against Arsenal, Newcastle and Bournemouth. While Chelsea look down on the rest, Cardiff will be frustrated the scoreline at Stamford Bridge did not reflect what was a spirited performance. Their poor run represents a change in form for a side promoted last season against the odds - and a new challenge for Warnock in the Welsh capital. Having proved the doubters wrong last season, Cardiff have gone into this campaign with much of the side remaining the same - and there has been little to suggest they can get upward momentum. The Bluebirds have scored just three goals from their opening five games, and Bobby Reid - signed from Bristol City in the summer - only once looked a threat to the Chelsea backline before he was substituted. There is no doubt Warnock has transformed the club, but Cardiff need a Premier League win - and soon. Chelsea have won their opening five games of a Premier League season for the fourth time - after 2005-06, 2009-10 and 2010-11 - more than any other team. This is the first time since 1921-22 that Cardiff have opened an English top-flight season without winning any of their first five games. Warnock has gone 11 Premier League games without a win as manager for the first time (W0 D5 L6). Cardiff are winless in seven matches in all competitions (W0 D3 L4), their worst run under Warnock; they last went on a longer run without victory between January and February 2015 (eight games). Since his Premier League debut in August 2012, Hazard (115) has been directly involved in more goals than any other midfielder in the competition (74 goals, 41 assists). Hazard is the fourth player to score more than one Premier League hat-trick for Chelsea (also Didier Drogba, Frank Lampard and Jimmy Floyd Hasselbaink). Bamba became the oldest player to score his first Premier League goal (33y 244d) since Zlatan Ibrahimovic in August 2016 (34y 316d). Giroud provided two assists in a single Premier League game for the third time in his career and first since January 2017 against Bournemouth. Chelsea's Europa League campaign begins on Thursday as they travel to Greece to face PAOK Salonika (17:55 BST). They then play West Ham away in the Premier League on 23 September (13:30 BST). Cardiff's next game is at home against reigning champions Manchester City on 22 September (15:00 BST). Attempt missed. Davide Zappacosta (Chelsea) left footed shot from the centre of the box misses to the left. Assisted by Willian. Attempt saved. Davide Zappacosta (Chelsea) left footed shot from the right side of the box is saved in the centre of the goal. Assisted by Willian. Attempt saved. Callum Paterson (Cardiff City) header from the centre of the box is saved in the top right corner. Assisted by Bruno Ecuele Manga with a cross. Substitution, Chelsea. Davide Zappacosta replaces Eden Hazard. Goal! Chelsea 4, Cardiff City 1. Willian (Chelsea) right footed shot from outside the box to the top right corner. Goal! Chelsea 3, Cardiff City 1. Eden Hazard (Chelsea) converts the penalty with a right footed shot to the bottom right corner. Penalty conceded by Sol Bamba (Cardiff City) after a foul in the penalty area. Substitution, Cardiff City. Gary Madine replaces Danny Ward. Substitution, Cardiff City. Callum Paterson replaces Bobby Reid. Attempt blocked. Eden Hazard (Chelsea) right footed shot from the centre of the box is blocked. Assisted by Marcos Alonso. Attempt missed. Bobby Reid (Cardiff City) right footed shot from the left side of the box is close, but misses to the right. Assisted by Danny Ward with a headed pass. Attempt missed. Pedro (Chelsea) right footed shot from the centre of the box misses to the left. Assisted by Antonio Rüdiger. Attempt missed. Joe Ralls (Cardiff City) left footed shot from outside the box is close, but misses to the left. Substitution, Chelsea. Ross Barkley replaces Mateo Kovacic because of an injury. Substitution, Cardiff City. Jazz Richards replaces Harry Arter because of an injury. Attempt missed. Sean Morrison (Cardiff City) header from the right side of the six yard box is just a bit too high. Assisted by David Junior Hoilett with a cross following a corner. Corner, Cardiff City. Conceded by David Luiz. Corner, Cardiff City. Conceded by Antonio Rüdiger. Goal! Chelsea 2, Cardiff City 1. Eden Hazard (Chelsea) right footed shot from the centre of the box to the bottom left corner. Assisted by Olivier Giroud.